A hanging lamp spreads the light into the darkest corner better than a table or shelf lamp can. This little oil lamp has a metal reflector that bounces light downward, where it is needed most. 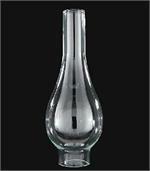 The hanging oil lamp from Sugar Creek Supplies burns clear K1 kerosene, Aladdin Lamp Fuel, or UltraPure paraffin oil. 2 inch by 9 3/4 inch height with 3 1/2 inch bulge Italia Bombe clear chimney fits most European burners requiring a 2 inch fitter base.